Topic Records is delighted to announce the signing of Rachael McShane & The Cartographers. 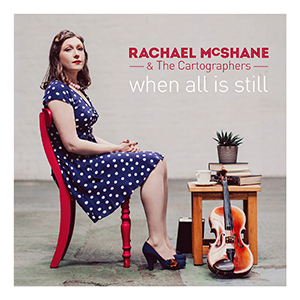 Rachael is probably best known as not only as string player/singer for the mighty Bellowhead but also a leading voice in The Transports (alongside The Young’uns, Faustus, Nancy Kerr, Greg Russell and Matthew Crampton). Her brand new album, When All Is Still (her first since 2009’s ‘No Man’s Fool’), sees her reworking traditional songs with a new band, The Cartographers, featuring guitarist Matthew Ord (Assembly Lane) and melodeon player Julian Sutton (Kathryn Tickell, Sting). When All Is Still is available now from Topic, Propermusic, Amazon, Spotify, iTunes and all good record stores. Listen to the first track, The Molecatcher, from the new album here.